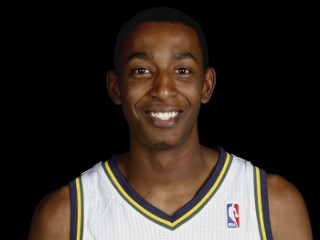 Jeremy Evans is a American basketball player who was drafted by the Utah Jazz as the 55th overall pick at the 2010 NBA Draft. A small forward, Evans played in college for the Western Kentucky Hilltoppers. Was the 55th overall selection in the 2010 NBA Draft . . . Led the Sun Belt Conference in field goal percentage (64.9) . . . All-time field goal percentage leader for Western Kentucky (.693) and all-time leader in blocked shots (224) . . . Honored with the Danny Rumph Outstanding Teammate Award . . . As a sophomore, named the Most Valuable Player of the Sun Belt Conference Tournament. Native of Crossett, Arkansas ... Lettered three years for Crossett High School, helping lead the Eagles to the state tournament each of his last two seasons ... Averaged 25.6 points, 11.0 rebounds, and 4.0 blocks per game his senior year whild earning All-State and All-Conference accolades ... In addition to being named All-State and All-League as a junior, Evans was voted the County Placer of the Year as Crossett High finished 17-10 ... Also an All-Conference choice his sophomore season ... Some of his art was also displayed throughout the WKU athletic offices ... Majored in interdisciplinary studies major with a concentration in art. View the full website biography of Jeremy Evans.